Amazon has become a recurring symbol of economic inequality for newly emboldened progressive Democrats. Why it matters: Despite its popularity with consumers, the company already shows up in fundraising appeals, legislative rollouts and Twitter threads — and looms over the 2020 campaign trail. In the past year, left-wing stars like Rep. Alexandria Ocasio-Cortez (D-N.Y.), Sen. Bernie Sanders (I-Vt.) and Rep. Ro Khanna (D-Calif.) have hammered Amazon over worker treatment, tax incentives and market power. Unions and labor groups are organizing the company’s warehouse workers and employees at Whole Foods, which it owns. Progressive advocacy organizations, including MoveOn.org and New York’s Working Families Party, have raised money or built their contact lists off of complaints about the company, according to ads archived by Facebook. Amazon CEO Jeff Bezos has acknowledged scrutiny as a fact of life, saying last year that "all large institutions of any kind, whether they be government agencies, nonprofits, universities, and certainly including big corporations, deserve to be inspected and scrutinized." The big picture: Democrats are gravitating towards the argument that big corporations have benefited from their innovations while working people have paid a high price. “The story of Jeff Bezos represents both the promise and the challenge of the digital revolution,” said Khanna. Beyond Sanders, Amazon’s critics include many of the other Democrats planning or contemplating 2020 presidential runs. “As one of the most profitable companies in the world, Amazon should be subject to oversight that protects the dignity of workers and ensures fair competition,” said Sen. Kamala Harris (D-Calif.) in a statement. An Amazon spokesperson noted that while the firm had recently turned solid profits, it was unprofitable for a long time. Amazon does not rank among the most profitable companies on the most recent Fortune 500. Sen. Elizabeth Warren (D-Mass.) has said Amazon should be prohibited from providing a marketplace for third-party manufacturers while simultaneously competing with them by offering private-label products. Flashback: For years, Democrats married their economic message with attacks on Walmart. Walmart responded aggressively, and so has Amazon. The company has already successfully neutralized one line of attack from progressive lawmakers. In early September, Sanders and Khanna backed the Stop BEZOS Act, which would tax companies for the public benefits their workers accessed. Less than a month later, the company announced it would increase its minimum wage to $15 an hour and advocate for a higher nationwide standard. "I've been very critical of them, but when these companies do take constructive steps we have to give them credit or there’s no incentive for them to do those things," said Khanna. 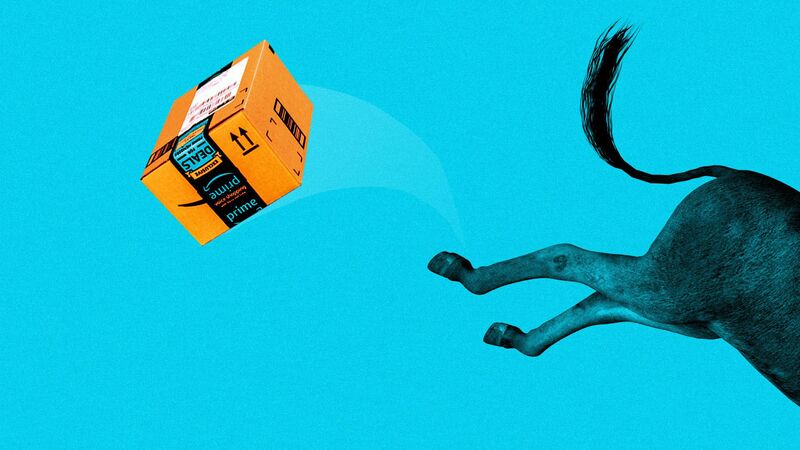 The other side: Democrats said they appreciated Amazon's innovations even as they worried that the wealth the firm has created wasn’t being distributed fairly. "We're not trying to destroy them," said Sen. Brian Schatz (D-Hawaii) of the tech giants, "but we are trying to make sure that their economic power does not diminish either the economic power of individuals or other companies." The bottom line: The progressive left is ascendant, thanks in part to an argument that big companies have delivered big wins to a small fraction of society.